This recipe further proves that armadillos do lay eggs; they just need a little help in the kitchen. This is the 1st family recipe calling for Shake ‘n Bake. #score! My Cousin Julie shared this recipe with me from her Mom Delores’ cookbook (my Mom Betty’s sister). I’m confident my Mom would have loved these spicy armadillo eggs because she loved jalapeños as much as Diet Coke, tea with freshly sliced lemon and crabbing at the Texas Coast (not necessarily in that order). ♥ Canned jalapeños. I’m a big fan of anything fresh so if you choose to go fresh for this recipe, change the pepper-wrapping technique below; simply cut-off the end of the jalapeño, seed it, then drop your block of cheese into the pepper and wrap. ♥ When there’s a 3-alarm fire in your mouth nothing simmers the heat better than ranch dressing. 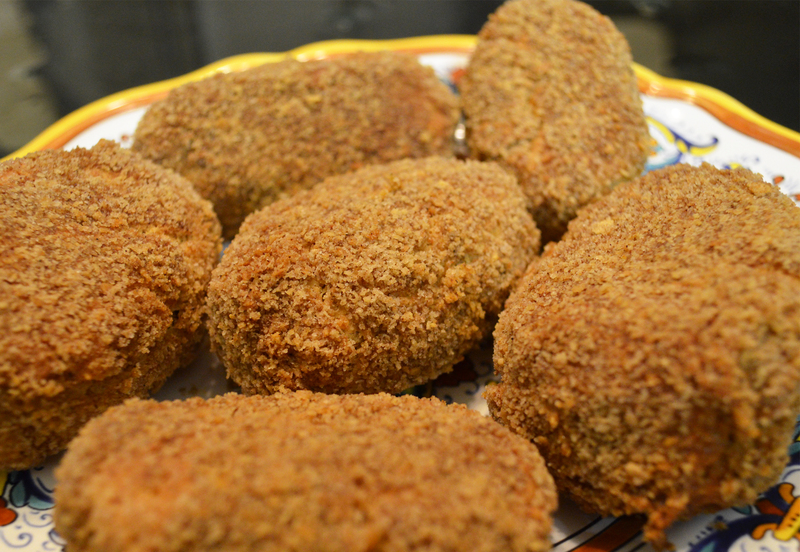 Try dipping your armadillo eggs in a bit of ranch dip and you’ll see what I mean! ♥ These are best enjoyed fresh but they can be refrigerated for a day or two. ♥ Love sausage? You might also try Mom’s spicy sausage ball recipe. Eating these will make your day brighter, I’m sure of it! 1. MAKE DOUGH: Mix the grated cheese and sausage. Add the biscuit mix ½ cup at a time until thoroughly mixed. The sausage mixture will become a very stiff dough and should be kneaded several minutes. Set aside. 2. FORM EGG: Pinch off a bit of cheese-sausage mixture and pat it into a flat pancake about ¼ inch thick. Slit and seed a jalapeño. 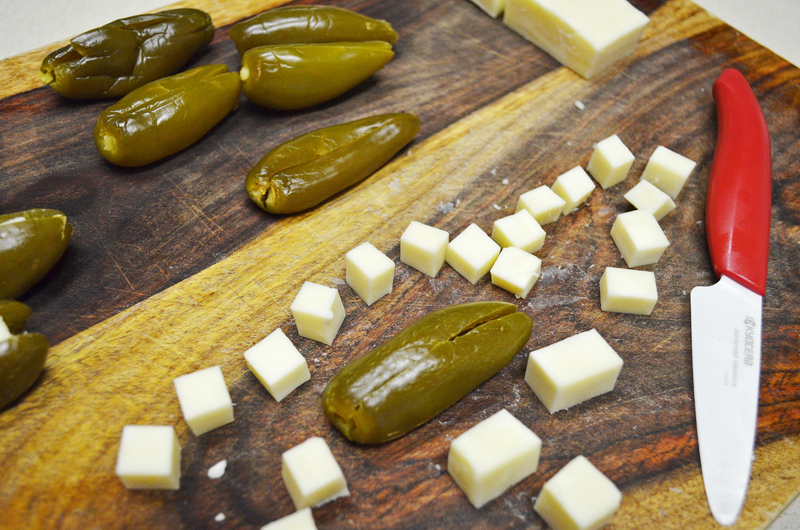 Stuff the jalapeño with a cube of cheese and pinch the pepper closed around the cheese. Place the cheese-stuffed jalapeño in the middle of the pancake and wrap it completely with dough, making sure that all edges and ends are sealed completely. 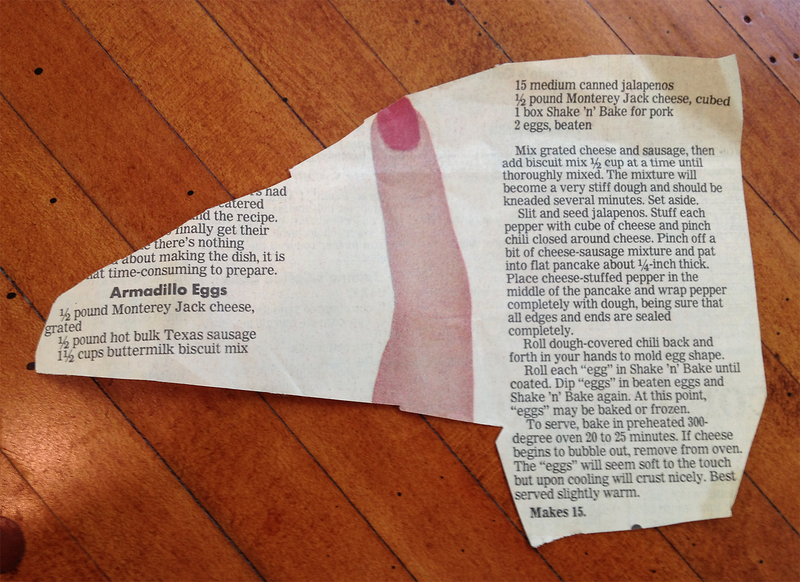 Roll the dough-covered jalapeño back and forth in your hands and form an egg shape. 3. 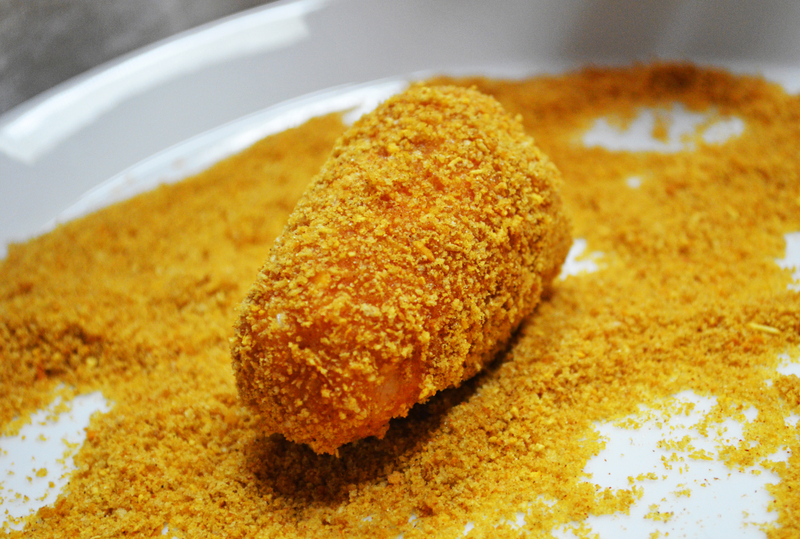 COAT & DIP EGG: Roll each egg in Shake ‘n Bake until coated. Dip the armadillo egg into the beaten egg mixture then roll them once again in Shake ‘n Bake then place your readied egg on a foil-lined baking tray. Continue steps 1-3 until you’re all done prepping your eggs. 4. BAKE YOUR EGGS: Preheat your oven to 300°F. 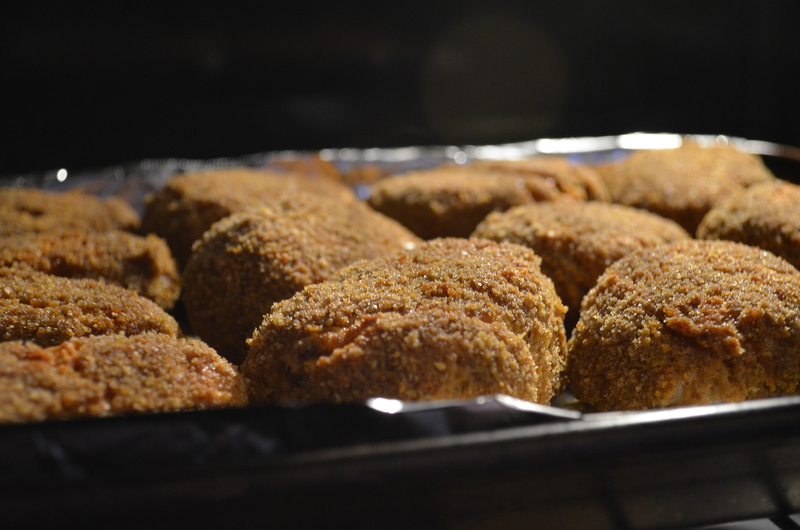 Place your armadillo eggs into the oven and bake 20-25 minutes. If the cheese begins to bubble out of the eggs, remove them from the oven – they should be done! The eggs will seem soft to the touch but after cooling a bit they will crust nicely. Serve them slightly warm.